My previous blog post, Considering BitGold (It's NOT A cryptocurrency), has me thinking about the banking system. Ever since I learned the fundamental truth about banks (and bank loans in particular) some 40 years ago, I have sincerely loathed the banking system. This loathing is, I'm sure, a big part of the reason that BitGold appeals to me. In this blog post I want to shine a light on the immoral, psychopathic loan scheme that banks routinely perpetrate on the unknowing masses. What I’m about to share with you is not common knowledge, but it should be. This fundamental truth about our evil banking system should be shared with all your friends and family. Our children should be taught the evil of banks and bank debt from a young age. Modern banking can be very difficult to understand, and I don’t understand it all, but I understand the evil bottom line that I’m about to share with you. This evil bottom line is very simply that when a bank loans you money, it is Ex nihilo money. Ex nihilo is a Latin phrase that means "out of nothing.” Ex nihilo is typically associated with the Christian account of creation. The Bible says that God created the universe and all that is in it—that He created it out of nothing (He spoke it into existence). Unless you are already familiar with this Ex nihilo creation of "money" by the banks, it sounds kind of unbelievable. But as proof of this claim, I would like to introduce the following YouTube film clip. In less than 2 minutes, two international bankers make it perfectly clear that when someone gets a loan from a bank, the bank creates the money “out of thin air.” Here is the link: Where Does Money Come From. In the case of our home (the little, tar-paper house my wife and I built shortly after we were married), my wife’s father, Jay Myers, loaned us $10,000. He was a retired dairy farmer. Jay accumulated the money that he loaned us by working hard (very hard), sacrificing, and saving it. He did not create it out of thin air. But that isn’t how it is with bank loans. Banks don’t work to earn the money they loan to their “customers.” They do not expend time and their life energy to accumulate the money they loan. They do not personally sacrifice anything to get the money. They just create an entry in a ledger and loan it to you. Prior to them making the credit-loan, the "money" did not exist. You are not allowed to pay the loan with money you create out of thin air. You have to expend your time, your talent, and your life force in order to earn the money to pay the bank. I hope you see the wickedness of this system. There is more…. A story of bank foreclosure was recently related to me by distant family members. The local Law came to the couple’s home and informed them that they had to leave. When asked what they could take with them, the Law told them they could take their clothing. Everything else belonged to the bank. In that particular instance, the couple had a thriving greenhouse business at their home, and income-generating commercial rental property in town, but they had fallen $11,000 behind in their bank payments because an employee was embezzling money. Being in a difficult situation, the couple had a $100,000 line of unused credit at the bank and figured they could tap into that to get them through the crisis. But the bank informed them that their line of credit no longer existed. When it was all said and done, the couple lost everything they had worked all their life for up to that point (over half a million dollars in total loss). Stories like that are common when it comes to bank loans, especially when the economy goes bad (and the economy always goes bad eventually). The incredible injustice of it is, once again, that the banks create the money out of thin air, and when it can't be paid back, the banks want tangible items of real value to satisfy their loans. If all of that isn’t bad enough, there is the aspect of interest (usury). The banks create money out of thin air, expect you to pay it all back, AND they want you to pay even more for interest. It is insult on top of injury. This fundamental lesson in thievery should make you suspicious of banks in general, especially the big banks. The big banks are perpetually scheming and developing techniques for fleecing the masses. You would think that creating money out of thin air, loaning it to people, and charging interest would be sufficient to make the banks all the money they could ever want (all without working for it). But the modern banking system is never satisfied. It always wants more money. Banking is the epitome of greed. And when the bank’s greed gets them in trouble, as was the case back in 2008, they expect the government (American taxpayers) to bail them out. 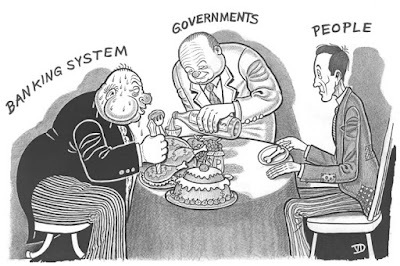 Fact is, back in 2008, the banking system’s top people in government (former high-level bankers hold the high-level positions of finance in our government) told the American congress there was no other option but to bail the banks out. Calls to Congress by Americans were 100 to 1 against any bailout of the banks back then. But Congress bailed out the banks. We now have government of the corporations, by the corporations and for the corporations, with the banking corporations being the most powerful. Or perhaps they are a close second to the military-industrial corporations. It's easy to go off on a rabbit trails when it comes to banks with their greed and corruption. My point with all of this is that there is more than meets the eye when it comes to bank loans, and I don't think that borrowing money from a bank is wise. I know that practically everyone does it, but that is beside the point. This same principle of Ex Nihilo money creation by the banking industry is also used in a big way to acquire the wealth of developing nations. The reality of this is mind boggling. Check out This 2-minute YouTube Movie. It is an excellent overview of how the game is played out. The narrator is John Perkens, a former "economic hitman." I should make it clear that this blog post is not directed at all the people who work for banks. My brother-in-law is in banking, and he's a truly great guy. My daughter-in-law also works in a bank. Although I personally would have moral reservations about working in a bank, there are plenty of decent, respectable folks who do work in banks. It's the banking system itself that is corrupt. Since 2008, I have noted that other than our Food Co-op, no other industry has expanded/built new edifices, except...banks. In our small town of 12,000, (for ref. the county pop 48,000) we have at least five local credit unions and eight major banking institutions and one local savings and loan. Isn't that a lot for such a small population? Banks are building, growing, while small businesses are closing up every month. Most everyone I know has two or more part time jobs to meet the bare bones of living. Very few are employed full time. The closest town/city is Keene NH and the local Olive Garden is closing Friday putting 100 people out of work. My bank, USAA Federal Savings, does not charge us for checking, requires no minimum, refunds us fees paid when using ATM's, as they have none, and calls me by my previous military rank whenever I call and is always highly respectful and effecient. Never had a bank like that. I have horrific tales of incompetence, outrageous fees associated with said incompetence and ridiculous, inconceivable experiences with banks. I flatout despise them. "Like most Americans in the 1790s, Jefferson was a country man. He believed that the nation’s future lay not with Federalist bankers and merchants, but with plain, Democratic-Republican farm folk. “Those who labor in the earth,” he wrote, “are the chosen people of God, if ever He had a chosen people.”"
Herrick, perhaps you've gone too far. I am a big fan who looks forward to every post. An analogy may better explain my thoughts. Your current posting is but a temporary ordered gathering of electrical or magnetic charges on a server in a data center of unknown location. It is no more "real" than the banker's money. It's not printed on paper stored on the shelf in my local library. Yet it functions as you intended: I read your writings, mulled your musings and strove to understand your conclusions. In an earlier time I would have read your poster on the tavern wall, seen it in a local paper, or enjoyed the article in a weekly newsletter, all hard copies, easily handled. Today it's "not real", it's "imaginary". Unless I print it I cannot hold it to read it, store it in drawer for posterity, or hand it to my neighbor for his enjoyment. Yet, it is real nonetheless. You worked hard to create it. And I enjoyed reading it. The banker's money is the same. It's a written agreement stored in electrical or magnetic charges on a server in a data center of unknown location. Can this system be (is) abused? Yes. Can people lie, steal and cheat.? Yes. Is it easier to do so? Perhaps. Until the security in this new information system has caught up to the many opportunities for our lower character to show itself, we will be its victims. Much like the western settlers were the victims of the lawless of their time and place. But I don't believe that the banker's money is no more imaginary than is your very excellent blog. Looking forward to your next posting. Cheers, Mike. Mike - I think you are missing the point. In days past, a local bank would loan based on its reserves of real money backed by a universally-valued tangible item (gold). Now we have a fiat currency and fractional reserve banking. I'd have no problem with a loan being issued and tracked electronically so long as it were backed by actual dollars that the bank had gained by legitimate means. Mr. Kimball's point is that these dollars are simply created in some big spreadsheet, not loaned from a stash that was accumulated through deposits of dollars that could at any time be redeemed for a tangible. Banks create and loan far more dollars than they actually possess. What really gives them authority to create virtual wealth? Herrick, I agree that our banking system is completely corrupt and immoral, and it is always refreshing to find other informed individuals who think the same. I have found the youtube series, "The Hidden Secrets of Money," to be very helpful in understanding the basics of money and how our government, along with big banks, work together to steal it from us. They are made by Mike Maloney with goldsilver.com and are very well produced. Episode four, "The Biggest Scam in the History of Mankind," was the most helpful in my understanding of the whole system. Thanks for the post. great post, i completely agree. the real question is now, "what do we do to avoid or fix it." a couple of key points. you mentioned that you started out extremely simple (in your first home). second, you mentioned getting a LOAN from Jay Myers. you HAVE to start with some initial $ that is not in your hand yet, right? 1) peoples expectations of what they should have go WAY up. since the bank makes "money easy" to get initially (the bait), young people (and old) think they should own a newer car, or get a larger home. we must fix our expectations of what is NEED vs WANT, and live within our means. 2) banks giving "easy money" also have pushed up prices dramatically. inflation contributes, and banks make inflation tolerable (until the debt is called). this is the issue that locks us up into the trap. real estate prices and especially 1st time home prices are WAY TOO HIGH for young people to start out reasonably! the only way i see us 'fixing' the current situation is for us individually to fix our desires for more, and to be content with what we have. those of us who are parents need to fix this with our children, too. they don't NEED a $400 smart phone with $100/month payments! they will NEVER need a new car! the last suggestion is that we as older adults with what little $$$ we have saved need to NOT plan for retirement, but use the $$$ we have EARNED to help the younger generation. SOMEONE needs to sacrifice to break the cycle. our retirement $ can help fund a young couple, willing to live very modestly, the $ they need to make their big start. it is up to ME to break the cycle. I am responsible in some ways for the mess MY children are inheriting. I need to be the one to NOT take Medicare, Social Security, and Gov handouts... EVEN THOUGH I'VE PAID THEM ALL MY LIFE. because MY money was used to pay for MY parents, and now the money I need is gone. are we willing to do the right thing (morally) to help fix the mess? thanks again, sorry for the rambling! Thank you, Herrick! Interesting and helpful, and a great resource to use with my teens to help them learn "how the world works" and to avoid the pitfalls! Can we all just finally admit that the current system, both financial and political, is broken beyond all remedy? When cancer spreads too broadly and deeply, the patient will die, regardless the measures used to defeat it. But abandoning all hope in the one irreparably damaged paradigm does not mean the abandonment in ALL hope! God's still in charge, and it still falls on His people to roll up our sleeves and work according to His design. As painful as it will be, I believe it would be a severe mercy for the entire financial and political system to just fail. As your post indicates, Mr. Herrick, we have been sowing to un-reality for a good while now, and reality WILL reassert itself, like it or not! No, you can't create money - more precisely, real value - ex nihilo! Not to merely wave the Confederate Flag here, but I remember the monologue given to General Jackson's character in "Gods and Generals", when he referred to "the triumph of commerce, the BANKS and the factory." [emphasis added] At first, I thought that was a strange thing to say, for, after all, there's nothing intrinsically wrong with things like manufacturing and honest commerce. However, the victory of centralization and corporatism that was inaugurated at Appomattox and has blossomed into the monstrosity we have now, makes those words' ring so true for me today, if bitterly. My depression era father, growing up here in rural TN said that one of the family mottoes was "Take care of what you need, and then maybe you can have some of what you want." Mature, sane individuals and families understand this, societies too! Most basic of needs is the production and procurement of food; that is best and most honestly provided through the hard-headedly practical Jeffersonian agrarian vision. But our society, with the help of the banksters, politicians, and assorted corporacrats (D or R behind their names makes no difference! ), has boomed based upon the un-reality of fiat money for so long, we can't even remember a time when things were different. At some point, again, reality will reassert itself! Yes, that is true. Until one recognizes why - it is not intended to be understood, as promoted. It is intended only to make bankers rich, richer than Croesus. Well, now - where to start? Oh yes, banking - lets start with the Fed. It is impossible it seems, to overstate the incredible degree of theft accompanying the creation of the "federal reserve", neither federal nor in possession of any reserve, save that small amount which was not immediately looted from a nation of victims. imagine, conjuring up out of nothing the ability to OWN EVERY THING with no more effort than the purchase of thoroughly corrupt politicians; a purchase which in the end cost nothing out of pocket. What we regard as "money" is nothing but a debt instrument, an IOU. Or rather no one owes you, but "them". And when the IOU is presented for redemption, what is given is another IOU. Payment in full never occurs, nor can it as it is merely an exchange of debt. In a nutshell, if you are the only borrower in such a system, for any amount of "loan", you can NEVER EVER pay it off. Why? Because you must borrow not only the principal, but the interest as well. An impossibility to pay. Now, if you are millions of borrowers - well, the process is the same - an annuity for bankers, perpetual payment stream. The loans in aggregate can never be paid, for both principal and interest must be borrowed. The banking system we know is nothing but a perpetual debt machine, a theft device conceived by and for bankers. With the stroke of a pen they received a monopoly on EVERY THING PRODUCED, in the past, in the present, and in the future. We do not need banks. Ever. Banks need us. Always. "From now on, depressions will be scientifically created." — Congressman Charles A. Have you ever read, 'Utopia of Usurers' by G.K.Chesterton? Or anything by Peter Maurin? I think you would find a strong Christian apologetic for a Christian economy (with no usury), and kindred spirits. Thank you for spreading the Gospel's social teaching! If you think the bail outs were bad, you need to find out about the BAIL IN'S that are now law!! Oh how much worse it is now, and it's a part of our deadly banking system! !